The new Ideal Church of Scientology and Community Center of Harlem opened its doors July 31, 2016, to a crowd of thousands of Scientologists and guests on hand for the dedication ceremony. 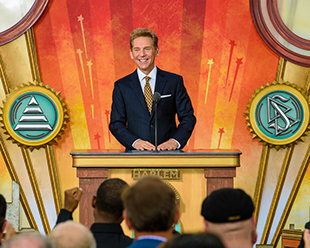 Mr. David Miscavige, Chairman of the Board Religious Technology Center, led the dedication of Harlem’s new Ideal Church of Scientology and Community Center. Thunderous applause greeted Mr. Miscavige as he took the stage for the grand opening ceremony held in the heart of Harlem, New York. Mr. Miscavige was joined by Harlem and New York City luminaries for the dedication. On a midsummer afternoon in Manhattan, some 3,000 Scientologists and guests celebrated the dedication of a new Ideal Scientology Church Organization and Community Center on Harlem’s famed 125th Street. Thousands of Scientologists and their guests congregated in Harlem, New York on Sunday, July 31, to witness the grand ribbon cutting. Harlem’s Ideal Scientology Church Organization and Community Center opened its doors, Sunday, July 31, 2016. Harlem’s very own Doug E. Fresh headlined a medley performance that jump-started the festivities and honored the rich musical history of the neighborhood. Mr. David Miscavige with (left to right): Rev. Joseph Jones, Human Rights Ambassador & 70th Precinct Clergy Council Member, New York City; New York State Assemblyman Robert Rodriguez; Rev. Johnny Ray Youngblood, nationally renowned minister and Senior Pastor at Mt. Pisgah Baptist Church; and Mr. Raphael Benavides, President of the East Harlem Merchants Association. After the ribbon fell, attendees poured inside eager to take in Harlem’s new Ideal Church of Scientology. Scientologists and guests from the community celebrated the new Center by touring every aspect of the facility. Harlem’s new Ideal Org played host to throngs of attendees who streamed through upon grand opening. The new Ideal Church of Scientology and Community Center Harlem stand as a hub for civic engagement on Harlem’s 125th Street. Just two doors apart, the facilities are dedicated to working side by side with groups of all denominations on an array of civic programs and humanitarian initiatives to strengthen and unite the community. The two buildings are located just one block from the Triborough Bridge and altogether total 66,000 square feet. The Church of Scientology of Harlem is both a place to service Scientologists in their ascent to higher states of spiritual freedom and a common meeting ground for the cooperative effort of all denominations in the name of community empowerment. RECEPTION Open seven days a week, morning to night, the Church of Scientology of Harlem Reception is the welcoming point for anyone wishing to obtain an introduction to Dianetics and Scientology. THE CHAPEL The Chapel, lined with the Codes and Creed of the Church of Scientology, provides for all congregational ceremonies and services—including Sunday Services, weddings and naming ceremonies. It further provides a meeting ground for the entire community in dedication to Scientology Founder L. Ron Hubbard’s vision of all denominations working together to achieve the common dream of all religions. Harlem’s Chapel is perfectly appointed to host every type of community gathering from interfaith seminars and conferences to concerts and civic forums. The Chapel also includes full banquet facilities providing an ideal setting for commemorating significant civic occasions and achievements—complete with a grand piano and state-of-the-art audiovisual equipment. The Café The Harlem Café welcomes visitors touring the Church or attending the many scheduled events and for parishioners during breaks in their Scientology services. The Church includes facilities for religious and community leaders to meet and collaborate in formulating and activating community initiatives. LITERACY & LEARNING The Tutoring Center provides tools for learning and literacy to people of any age. After learning these fundamentals, students routinely improve entire grade levels and gain the ability to master any subject they desire to learn. Introductory Services The Church of Scientology of Harlem provides for the delivery of all Introductory Services. These include evening and weekend Dianetics and Scientology seminars imparting an overview of fundamental principles and their application for living. Among the many introductory Services available is an entire array of Scientology Life Improvement Courses to help better any aspect of one’s life. DIANETICS & SCIENTOLOGY BOOKSTORE The Church of Scientology of Harlem Bookstore makes available L. Ron Hubbard’s works on Dianetics and Scientology. In all, Mr. Hubbard’s legacy spans tens of millions of published words in dozens of books and thousands of recorded lectures. Materials are available in 50 languages. THE ACADEMY The Academy is where Scientologists train to become auditors (spiritual counselors), capable of applying the technology of auditing to help others attain spiritual freedom. Harlem’s new Ideal Scientology Church and Community Center is called a “center of hope on 125th Street” in stirring grand opening ceremony held Sunday July 31, 2016. Water surrounds it. The East, Harlem and Hudson Rivers form its boundaries, but Harlem is transcendent. For generations, this neighborhood has been the spiritual center of African-American and Caribbean life in the United States. Trends in music, dance, poetry and art regularly emerge from this place just north of New York City’s Central Park. Its cultural significance reaches far beyond its physical borders—Harlem runs deep into the soul of America. On Sunday, July 31, the Church of Scientology opened a new Ideal Church and Community Center on Manhattan’s famed 125th Street. The occasion marked a celebration of the very Harlem spirit that has permeated the cultural landscape of American history. From live entertainment that featured odes to Jazz, Afro-Latin dance, Beatboxing and Hip-Hop, to dignitaries who span the political, cultural and spiritual spectrum of Harlem and New York City public advocacy, the new Church and Community Center was inaugurated in a ceremony that evoked the life-affirming passion for which Harlem is renowned. Stemming from Mr. Miscavige’s leadership, the Church of Scientology has opened the doors to more than 50 Ideal Churches—from Los Angeles to Tampa, London to Milan, Johannesburg to Tokyo and Budapest to Kaohsiung. Over the past decade, those openings have driven worldwide expansion for the religion to a rate surpassing the previous 50 years combined. And like so many of the cities that now call an Ideal Org “theirs,” Harlem has formed a decades-long relationship with the Church, working hand in glove with individuals and groups on literacy programs, drug-prevention initiatives, human rights awareness and morals education. To that end, the Harlem Community Center now gives a permanent home for grassroots delivery of important programs like The Truth About Drugs, United for Human Rights and The Way to Happiness. The new Church and Community Center are located just two doors apart on 125th Street—Harlem’s main street—and just one block from the Triborough Bridge. Altogether, the two buildings total 66,000 square feet and stand as a beacon for community engagement in East Harlem. “This new Community Center represents not just an offer to help, but rather, our obligation and right to help. Because, no matter what makes each of us individuals, we all represent the brotherhood of man. And so, there is no escaping the fact that anyone’s suffering is also our suffering. And, that none of us are free unless all of us are free. When you track that to the end of the blackboard, it becomes no less than our inviolate duty to introduce humanity to every last living soul. And thereby keep faith with the family of man,” said Mr. Miscavige. In the spirit of that offering, the thousands of Scientologists and guests in attendance were joined by city and state dignitaries in welcoming the new facility: New York State Assemblyman Robert Rodriguez; Rev. Johnny Ray Youngblood, nationally renowned minister and Senior Pastor at Mt. Pisgah Baptist Church; Rev. Joseph Jones, Human Rights Ambassador & 70th Precinct Clergy Council Member, New York City; and Mr. Raphael Benavides, President, East Harlem Merchants Association. The impact that Scientology has on the fight for human rights was apparent in the Reverend Joseph Jones remarks: “We’re here to stake a claim for today to design our own tomorrow. And it’s a tomorrow inscribed with that term: ‘Human Rights!’ Your human rights program has taken on a life all its own. It’s an unstoppable train hurtling toward freedom and justice. After all, your effort for a person’s rights was born out of the inspiration of a ministry led by that visionary, L. Ron Hubbard. And thus, it stands in recognition that the human spirit is still our greatest resource—united in a cause there is nothing that can defeat it. The new Harlem Ideal Org provides visitors with an introduction to Dianetics and Scientology, beginning with the Public Information Center. Its displays, containing more than 500 films, present the beliefs and practices of the Scientology religion and the life and legacy of Founder L. Ron Hubbard. Harlem’s Ideal Org also features a Chapel that provides for Scientology congregational gatherings, including Sunday Services, weddings and naming ceremonies, as well as a host of community-wide events open to members of all denominations. The facility further includes multiple seminar rooms and classrooms and a complete tutoring and learning center, in addition to an entire floor dedicated to Scientology auditing (spiritual counseling). The Harlem opening continues an unrelenting growth period for the Church in the past 12 months. Recent Ideal Church openings have occurred in Budapest, Hungary; Atlanta, Georgia; Milan, Italy; Tokyo, Japan; Bogotá, Colombia; and Basel, Switzerland. Also, the Church recently opened Scientology Media Productions, a five-acre, technologically cutting-edge studio in Hollywood, California, in which the religion’s message will be proclaimed via television and radio broadcasting, Internet and social media and every other media platform. And more is on the way, with openings of more Ideal Orgs in the coming year planned for cultural epicenters in Australia, New Zealand, Europe and North America.